Strawberry tiramisù: delicious and easy to make! The recipe to prepare a very special tiramisù. The most famous Italian recipe in another and tasty version, try it and enjoy with your family! 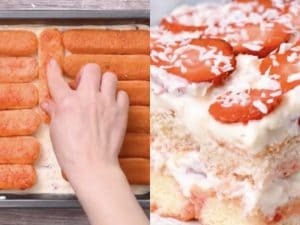 Ingredients: 100g strawberries, 40g sugarlemon juice, 4 yolks, 100g sugar, 500g Mascarpone, 400g strawberries, sliced, 150g white chocolate, finely chopped, 4 egg whites, 200ml whipped cream, 20 pcs Ladyfinger cookies, shredded coconut. To decorate: strawberry, shredded coconut. 7. Dip ladyfingers in strawberry mixture and put in a baking form. 8. Pour half of the cream and sprinkle with coconut. 10. Decorate with strawberry slices and sprinkle with shredded coconut.